Let the kids burn off some energy on the football field at Les Peneyrals campsite. Have a go on the waterslides Les Peneyrals campsite. Les Peneyrals campsite is a Eurocamp splash park. You can even try horse riding during your holiday. Water sports are available, a great thing to do for a memorable holiday. Explore the holiday park on 2 wheels - and hire a bike! The lake here makes an ideal place for a picnic. This holiday park has a covered pool; a bonus to all those out there who are worried about getting too cold! Want to explore? Les Peneyrals campsite could well be for you. Want to have a closer look at Les Peneyrals campsite? If you think Les Peneyrals campsite in Salignac, Dordogne is the holiday park you, why not have a closer look, and check out prices and availability. Les Peneyrals campsite family holiday park has 250 pitches. Eurocamp have family holidays parks all around Europe. 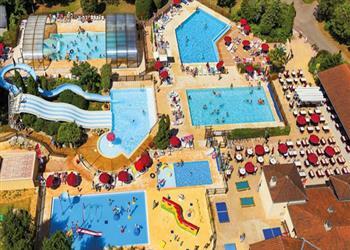 Les Peneyrals campsite (DR011) is just one of the family holiday parks in Salignac, Dordogne, France. Have a look for other holiday parks in France. You can also see what other people though with the reviews of Les Peneyrals campsite. These are the reviews for Les Peneyrals campsite. There are 126 reviews. Friendly, well run park with excellent facilities, pools and bar/restaurant. Great for families. This parc has everything to keep kids happy. It is set in beautiful surroundings and the family that run it can't do enough to help. Absolutely brilliant holiday. The park is amazing, so clean and so we'll run. The pools are fantastic, something there for everyone even the really little children. I would no hesitation in recommending it as a perfect holiday destination. The park was great for kids and the staff friendly. But our accommodation was dirty and a little tired and the eurocamp rep met us on the first day and then did her best to avoid us for the rest of the holiday. It was her last week and I think she couldn't wait to finish. We have two 5 year old boys and had been lead to believe from other people's experiences in other camps that the reps engaged with the kids and encouraged them to get involved with the kids club, our rep did no such thing. So combine this with the accomadation which had been swept though at best before we arrived and I can only rate it a 6 out of 10 for value for money. The park is located in a good area just 10 minutes from sarlat. The local area is very nice. It is within easy reach of many nice market towns, caves and canoeing etc. There are also plenty restaurants to choose from in and around sarlat. There are 4 supermarkets within 10 minutes too. . . the park itself has a fantastic pool complex which is ideal for all ages. There are warm pools, cold pools, indoor pools, splash pools and slides. There are also plenty of loungers. The bar, restaurant and takeaway are very good. They are very reasonably priced and the food is good. The kids play park is also very good and varied with plenty for all ages. The crazy golf is fantastic. 18 holes and much more interesting than the usual. . . the site can be a little noisy in the evening due to entertainment but nothing outrageous. There are also a couple of hills depending on where you are situated on the site. These were unmanageable for our kids on their bikes but otherwise fine. . the reception staff on site were extremely helpful. They were very knowledgeable about the local area and activities and spoke very good english if needed. They helped us book some visits in advance to avoid queues and gave us good recommendations on different activities. . . the site run kids clubs were enjoyed a few times by our kids (4 and 8) the teachers were very friendly and ran many activities throughout the day and evening. . the caravan pitch itself was pretty small - the car took up most of the grass and the site was in shade the majority of the day. The caravan was pretty dated and in desperate need of a clean. It was dirty in all the corners, stains across the bathroom ceiling, bits hanging down from ceilings. The bathroom also had a bad odour of stale urine which we identified as coming from the over-flowing toilet brush holder (which we quickly removed). on opening the freezer on the first evening it spilled out several litres of water so not a great first impression! the eurocamp couriers weren't really seen. Our only contact was one girl who came to fix our heating who seemed friendly. They don't run kids clubs at this site and they didn't come round to see how the holiday was or leave a note or anything in our 8 days there. So friendly but elusive. . all in all a fantastic site which I would recommend, though I would book direct and save some money as I don't see what eurocamp offer here. Overall a very good site offering plenty to do and within reach of many interesting places. Great pool and evening entertainment. Nice site , friendly, great pools only a little hilly . our friends were sited at the opposite side of camp but we're moved to a mobile home opposite us after two days which was great . the couriers were helpful and friendly. The mobile home was comfortable a little tired in places our windows didn't lock but we're sorted out straight away after being told . restaurant served nice food at reasonable prices . all in all a great holiday . would definitely go back . Our 14 year old son thought it was the best holiday ever and we had a very relaxing time. The campsite staff were great, very helpful & knowledgeable. Site clean, lots of activities & great pools. Downside it was very noisy where we stayed next to the lake due to nightly entertainment and very busy by the pools. Eurocamp staff poor, not there when we arrived at stated time. Mobile home very small, not enough room for 2 small suitcases. This is our third time going to this campsite, its well run with lots going on. Friendly staff on hand. My children enjoyed the water slides the most. We thoroughly enjoyed our time at this site. it was very clean and well maintained. the pool complex was great and we liked the fact the slides were watched by site staff who didn't hesitate to use their whistles!!! we ate in the restaurant once and had pizzas which were lovely! overall a lovely site. Parc was excellent, top quality. Only minor issue was some loose slabs in the swimming pool area, which could have caused nasty foot injuries or trip. . couriers were invisible in euro camp uniform. The only time we saw them was in the pool or sunbathing. They didn't even come to see us before we left which keycamp couriers have always done on all our other holidays. Lovely area with lots of places to visit for history buffs. Canoeing a must as give brilliant perspective of the dordogne river, towns and castles. Our two girls took their scooters but never used them due to the slopes around the park. The evening entertainment very good. The girls 13 & 8 played in the park most evenings while we sat in the bar area. When it rained it 'rained' but the dry days were very warm. Go for air conditioning as fans can only blow so much warm air around - we would come back. Fantastic family orientated parc, with activities for all and a superb location. plenty of acitivities in the surrounding area with lots to do and see. We had a great time revisiting the area we came to many times when our children were small but this time we had our grandchildren too. Excellent site!! eurocamp couriers were non existant even on our last day I had to go and find them to give the caravan key back. caravan dirty and shower disgusting, caravan very shabby. site was beautiful which made up for the eurocamp's lack of service during our holiday. A nicely set out park which was clean and tidy and well maintained for the most part. Some good sized plots. Staff friendly. The park was quite deceptive - some holidaymakers thought it bigger than they expected and others, like ourselves, thought it quieter than we expected (and possibly wanted, since we have a 12 year old whol didn't get same opportunities to mix and make new friends). all in all a nice park with nice pools and not too crowded. Really poor accommodation. This is the third time we have been with eurocamp and the caravan was awful. Very disappointing. couriers nice and friendly, site good, setting lovely. Great site with a really nice family friendly atmosphere. it was clear that this was a family run business and the family were always around the site ensuring everything was running smoothly. the onsite food was very good and well priced. the pools were warm and our children would have been happy to stay in them all day and every day. the entertainment was good and plenty of variety. we thoroughly enjoyed our time at the site and would go again. the eurocamp couriers were also really great at this site - they were friendly and always available. Eurocamp couriers were unhelpful and uninterested in any problems we encountered on our holiday which was extremely disappointing. Mobile was tired and shabby; overall poor quality. Staff great - nothing too much trouble. First caravan was on main highway and 'squeezed in' and got too hot. Moved down to nicer one down the track. Parc good. Chose as no height restrictions on slides and kids loved it. Parc was pretty good, although pools were smaller than they had looked online and whilst the entertainment was very good, it was also very loud so could be heard throughout the parc! caravan was fine but a little grubby and unfortunately over run with ants- I think we were unlucky though. I think it was quite an expensive holiday, but great for children, so I would recommend it. My family had a great holiday here despite my son breaking his collarbone on the first night. The park is very clean and well maintained. The staff and entertainment staff work hard to ensure you have a great holiday. The park is well placed to visit lots of places around. Next time we would take a mobile home with air conditioning as it was very hot at night. Great park for families. Our avant caravan had a few problems though, from missing items on arrival, a bad ant problem from the sticky sweet a previous guest left behind and sticky doors (the handle fell off one day making it impossible to open). i'd recommend the park but would not choose an avant again. Whoever thought that a single bathroom (not a separate loo) for a caravan sleeping up to 8 was a good idea?!?! This was an overnight stopover, site was lovely, and would consider returning to this region to explore further. A very friendly park who even had their own ball and fireworks display over the lake for bastille day. Great pools with lots of space for all ages. Entertainment in the evenings was generally good with ttc the concert band being excellent. Owner is friendly and works very hard every day overseeing everything. Couriers were polite and hard working although their local knowledge could of been better. A fantastic family parc, good value & amenities. the whole parc was very clean, tidy and well organised. the entertainment team at the parc were really good, being able to cater to all age groups simultaneously. The camp shop/bar/restaurant were all very reasonably priced. Fabulous park, the owners really went out of their way to make sure everyone had a good time. A fantastic park - it was relatively quiet for our first few days, but even when it was busy you didn't feel like everyone was on top of you due to the variety of swimming pools and water play areas. Very friendly owners, and a great family feel to the park.the eurocamp team made us feel really welcome, and were very helpful when we went to them for advice or with questions. Easy to access the dordogne river and beautiful towns and villages around the area. Caravan was basic, but adequate, and a good layout. A major bonus was a lovely 'garden' area (which all pitches seemed to have) which was very handy for us with 4 kids!!! it's fair to say we loved this holiday, and although we don't normally go back somewhere twice, we are definitely considering returning here. We had an awesome week holiday here may 23rd-30th and will definitely be returning. The park is perfect for families with plenty to see and do, lots of activities (put on by the park) and the pool, park and bar are all in very close proximity so this is perfect when the children want a little bit of independence. I cannot recommend this park enough. We didn't see a lot of the eurocamp couriers, however when we needed their help they were not too far away. We have been with euro camp for a couple of years now and looks like they have cut down a little on the extras in the accomodation (last year we had playing cards, eurocamp bags etc.) however we did get a bottle of wine as returning customers. Brilliant holiday, excellent weather and excellent parc. The campsite was one of best we have been to. Great pools including heated indoor pool which we used on the cooler days. Kids (4 and 6) loved the slides and splash park, mini golf and the play area. Great evening entertainment with live music, karaoke and discos. Restaurant food was delicious. Well located near sarlat, domme, beynac etc. The weather was mixed when we went in august. We were holidaying with another family and they got sited the opposite end of the campsite - we booked 13 months ago and made it very clear we wanted to be near each other! We paid extra for a deluxe cabin for the first time and were utterly disappointed. What is the point of putting six people in a cabin and only providing seating for four. An uncomfortable settee to seat three and one chair. Then to only provide four chairs around the dining table one of which was already collapsing, there was a local issue which was being dealt with, but was only solved on our last night, which didn't really help us much. The deluxe pitch was crammed into the middle of half a dozen ringed round it all looking in, so no privacy whatsoever. One would have thought that paying extra would have got a better pitch, at least where the kids could have played. The were lesser cabins on better pitches, so it is possible. The eurocamp couriers were great and helped us when we had car troubles and had to relocate to les mouettes, the local staff were hit and miss, some very nice, some downright surly. The clientele were the most unfriendly we have ever come across, and we could not even get a nod or bonjour from anyone. We got more response in one hour at les mouettes than in two weeks at les peneyrals. We were so disappointed by the supposedly deluxe cabin, and delighted to be put into a classic plus in brittany where we could at least all sit down! Amazing park but not great weather! We travelled with our two boys (14 & 10). it had been 6 years since we eurocamped and wasn't sure if the kids would enjoy it. Needn't have worried, they loved every part of it. During the time we were on site we hardly saw them because they were having so much fun meeting other children from all nations. Plenty to do on site and the pool complex was fun for them. The site restaurant was excellent with a daily special and plenty to choose from the main menu. Entertainment not very good, overall we had a good holiday!! Lovely campsite with excellent facilities. Great for families, especially the pool complex. Weather not as good as previous years but this appears to have been the case across most of france in 2014! Traveled with husband and 11 year old son . . great facilities on the park several pools (toddler, covered, main and quieter infinity pool),good playgrounds and facilities. The owners had also thought about activities for teens and pre-teens as well as the usual kids club which was a refreshing change. The location is really convenient to visit the dordogne area although being in the hills it can be several degrees cooler than in the valley. Take your own boules, table tennis bats & balls, fishing rods etc. It can add up if you keep hiring from the site. You can buy some items from the on site shop boules approx. €10, table tennis bats €5. Nice pizzas made on site which can be eaten in the restaurant or taken away. Drinks in the bar reasonably priced. Evening entertainment is a bit hit and miss some of the bands were good, the site is very multi-national so the music quiz evening was very interesting!. . we love the area it's so pretty. Our must visits are domme, beynac, sarat especially on an evening, marqueyssac gardens (rockclimbing and via ferata for the kids), rocmadour etc.loved kayaking down the river. Suggest go mid afternoon to arrive in beynac around 6pm when the river is less busy. Also leave you car in beynac and take the kayak company bus to the start point vitrac? this avoids having to wait at the end for the bus back to your car. Weather was a bit hit and miss the first week, lovely the second.only real downside is it is really busy in august and parking can be an issue. . . we stayed in a three bed eurocamp mobile home. It had more spacious living area than expected and better than expected kitchen facilities i.e. Cooker and fridge/freezer, microwave etc. Mattresses were very thin and uncomfortable as were pillows and both really need to be replaced. The bathroom although relatively clean needed to be treated for mildew especially around the shower. We had a lovely decked area with furniture and a bbq which were both used to good effect. . all in all we had an enjoyable holiday and there was something to keep everyone happy. Great family holiday at les peneyrals. Kids ages 12 and 8. the youngest had the best holiday to date. it was nice to see such a close-knit team - the owners definitely know how to run a parc - the food was very good and the entertainment was fun, a couple of great bands (ttc & the roadys) plus a firework display which all added to a very special holiday. Would 100% recommend this parc to other families. the only minor downfall was the cycle hire (bikes were poor) and bottom football court had seen better days. The parc is pretty good with most activities free of charge (table tennis, swimming, boule and so on). mini-golf is chargeable rather than deposit which can add up quickly. The pools are clean and look well maintained with a lifeguard on duty at the slides and within earshot of the rest of the pools. One pool has sliding walls and roof so is warmer and can also be used on rainy days. English is commonly spoken to varying degrees and the staff are friendly and very tolerant of stilted attempts with the french language. Evening entertainment was varied and of a decent standard (although we can't say the same for the karaoke singing). the restaurant has a varied menu and the prices are reasonable. The shop is pretty well stocked with the basics and not hugely overpriced and there's a nearby carrefour for the extras. The site is well kept and not as large as it looks on paper but is a tad hilly. The only downside of our break was the bedroom size in the esprit 3 bed. A 10 inch gap around the bed is wearing on shins, toes and backs, climbing in and out of bed is a real chore. Fridge is large and spacious and the inclusion of a bbq makes self-catering more fun. Excellent parc, the best we have been to and the couriers were friendly and helpful. We had a really nice holiday. The staff are friendly and the site has really good facilities. The whole site is clean and I would recommend this site. We had a great time at this camp. Centrally located to explore all the dordogne has to offer. We had a good holiday despite the wet weather! great pool complex. . Excellent parc, but not keen on the gravelly paths - bit dangerous for kids on bikes. Accomodation ok, but not as good as the old key camp caravans. Excellent value for money - though having checked next years prices it will cost us double for the same thing, so will look elsewhere. The dordogne is a truly beautiful area with lots to do whether you like activity or just sightseeing. The parc was well equipped and clean with good facilities; great pools and play areas. It was a bit too noisy for us at night as we were close to the action (but that is just our preference). Park has good pitches, nicely separated with hedges, quiet roads, great pools and slides and table tennis, badminton etc. Very friendly for kids. Great area for visiting chateaux, canoeing etc, really enjoyed our first campsite away from beach as kids a bit older. . only negative would be showers/ toilets under pools were dark/unclean a lot of the time. I reported this to campsite and emailed eurocamp about it too. Great holiday in the fantastic dordogne. Fantastic campsite which we couldn't fault. We went during the last 2 weeks in july and the numerous pools meant that there was plenty of room for all ages. We have a 3 & 7 year old so it was perfect. Ideal campsite for young families. We give this a 10/10 without reservation. Second centre out of a two week holiday so we only had 5 nights here. lovely site and region. We had a brilliant holiday at les peneyrals. the campsite is fantastic for children (ours are 6 and 4) with a splash park, playground, mini golf etc. we only used the campsite's own free kids club for one session on our last day and regretted it as they had such a brilliant time with there!! . . only slight negative was that the mobile home had a very uncomfortable sofa, but I can certainly live with that as the only downside. . would love to return. This is a fantastic campsite with great facilities, but it is unfortunately in a poor geographical location. . the site itself has a good selection of facilities to entertain family and kids with table tennis competitions etc daily. The kids park is of a good standard and has 6 table tennis tables and crazy golf right beside it. We were able to do these activities and easily keep an eye on kids. Pools are great and well maintained kids area is great. Bar area is fine but nothing special and food served is also quite nice. You are probably reading this wondering how come ive scored it so low, so let me explain. First of all, the site is set at quite a high altitude so it recieves quite haphazard weather patterns and relief rainfall. Ive never had so much change in the weather anywhere else. On these days we went to sarlat about 12miles away and it was hot and sunny in alot if these wet days which was very frustrating, but we just chilled at mcdonalds and let kids play in kids area, grabbed a coffee and used free wifi. There is a big carreflour there too for groceries. Secondly on site there is annissue with flies. The damp muggy conditions means they are everywhere and when we ate in restaurant we were tortured by them. this might sound trivial but believe me its not pleasant when ur eating dinner and flies are constantly jumping on and off your food and body, drove me mad at times. as a result we ate inside the caravan alot. On two occasions I killed over 20 flies inbthe caravan before we could eat in peace. Finally, we stayed in a classic 3 bed caravan that was of a decent standard, but the double room mattress was horrendous and my wife and I struggled to sleep all week. Also the sites on which the caravans and tents are located are surrounded by quite high trees, this meant it was more chilly and we couldn't chill around caravan to sun bathe or chill we had to go to the pool area. Here are a few other tips:. . - kids club is ok but very repetitive stay inside and do art and craft alot, even when its hot. Our kids were bored after a few days and didnt return. - for groceries dont go to intermarche in salignac which is 4km away, go to sarlat which is 12km away; intermarche is poor and quite expensive, but does have laundry facilities which are 2euro cheaper than campsite to do a wash. - wifi is expensive on site about €20 fir week but if you buy an hr for €2 or 3hrs for €5 as long as you disconnect your wifi connection eqch time you can use it min by min. . hope this is helpful, don't mean to make it sound negative but if we had known these factors before it woukd have helped us make a better decision. Made the best of our week and had a nice family time, was great with the world cup on as they put a big screen up and atmosphere was good, but to be honest if you travel 1200 miles from belfast to the dordogne you want hot weather. This location will always struggle to give you this with its geographical situation. Better hitting center parcs and playing the weather lottery alot closer to home. Caravan for grubby so initial impression was marred. Senior courier dealt with issues. Very steep hill to main area. A bike with lots go gears required! Lovely parc and surroundings. Well kept and clean. A little bit hilly but that is because I have some limited mobility. Having said that I would return to this parc. Would definately come back here if in the area. Good welcome from the owners. Pools and slides good. On site restaurant and pizzeria were good. No one mentions the barking/howling dogs from the local farm which can be heard most evenings - quite disconcerting but I guess you get used to it by the end of the week. Excellent campsite but very hilly kids couldnt use bikes. no eurocamp clubs and not enough activities for my ten yr old daughter or 9 year old son. more football for boys and activities for girls would have been good.owners very helpful and bar pool, football field and park being all together provided safe fun for all the family. Excellent campsite in ideal location with all necessary facilities. Wonderful park. Facilities excellent. Go to sarlat, beautiful. Our accomodation was clean. No complaints at all! We stayed as part of a group of 3 families with preschool age children during june. Our caravans were next to each other which was handy. We all had a great time at this site, the kids loved the pools and play areas and it was lovely and quiet as it was before the school holidays. we had amazing weather which also helped. . I would definitely look to use eurocamp again in the future. Fantastic holiday with my wife and 2 year old. The parc was great from the swimming pool to the kids playground. Food in the restaurant was also good. the eurocamp couriers were a great help too. Fantastic park, perfect for kids and families. Excellent food in the restaurant. Everything on site for kids . 5 pools that were all clean and safe . courier on arrival made sure we had everything we needed a choice of barbecue ( charcoal or gas ) which was brand new . nothing was too much trouble . parc fantastic , kids did not want to go else where site seeing they loved the parc . Sadly, the weather was awful for our holiday which really did put a dampener on it! the park was loveley -the best I have ever been on and I have been camping a long time. That was staff and facilities I am talking about and we really do want to go back there - when it is hot! the eurocamp rep - mark was extremely good and a big hit with kids. We had a mouse infected chalet and the mice were well established and obviously been there before we got there.we should never have been put in there. Overall the camp is extremely well kept, well maintained and spotless. . we arrived with a very friendly welcome, and our boys were given a football on arrival which I felt was a really nice memorable touch for them. . the food at the restaurant was excellent, we all really enjoyed the pizza very authentic ! . . thoroughly enjoyed our stay and will not hesitate to recommend to friends. Fabulous campsite, lots of facilities but without being too big. Indoor pool an absolute blessing. Lovely and warm. shame the outdoor pools / slides were too cold to use much but we were there late may / early june. we will definately be going back. Only there one night, but everything seemed fine. We had such a great time here that we are planning on going next year too and bringing along some friends. The pool area and the fishing pond were the highlight for us. Really enjoyable holiday. The only downfall was that the bar menu wasn't great, the shop didn't have a very big selection and our daughters scooter was stolen. But overall a great holiday. We would definitely return. The splash park could have been a bit warmer, as our 8 month old loved it, but couldn't really use it. Really nice clean campsite, well looked after and with all the facilities you would need. We all really enjoyed our stay at les peneyrals. Plenty to do as well as the pool and slides. The children (aged 11 to 14) enjoyed the organised activities (badminton / football etc etc). we all really liked the dordogne. Evening food 'market' at salignac was nice, with a good atmosphere. we could have done with knowing they have tables so that you can eat outside there, and you buy the food for your meal whilst there - making at a more reasonable price to 'eat out' for a familiy and you get the atmosphere as well. This is probably the best parc we have ever stayed on and is also in a lovely location. The pitches are really well thought out (as opposed to just packing as many vans on a site as possible,) the owners were also very good and gave us a personal welcome in addition to that provided by the eurocamp couriers. Pool area was excellent and safe for the children. very good facilities and lots of varied activities both on and off site. Can't fault the parc at all, it was lovely but just not suitable for 2 teenagers! not much for them to do apart from swimming or fishing! not so great when your a 15 year old girl! the van was spacious but having been a eurocamp customer for many years we know it was an original old van, on the plus side it did have english sockets! Stayed at 4 parcs in total. First was terrible, but next three (including this one) were fab. The pool complex here was brilliant, could not wish for more, as was the playground. Fab restaurant, great entertainment, lots going on to keep kids amused and very helpful parc owners. Perfect weather. If you have three or more kids do not book a 2bed horizon home, even if you are told it is all you need. It was nowhere near big enough and it really took the shine off the holiday. Great holiday parc though. Full on fun for kids , reps v helpful and the pizza s fantastic. The parc was excellent value for money! This holiday was by far the best and we are already looking at costs for 2014 and going back to the same place. Les perenyals is perfect for families with small children and has plenty to offer to keep them entertained so that parents can find time to relax also. The park is set in a lovely area, with plenty to do for kids and adults alike. very nice park, entertainment available, good facilities for all. Lovely campsite in great location, private pitches set among trees etc. Great pools, play area and shop. Pricey restaurant and noisy on some evenings but overall a big thumbs up. This was an excellent stopover location, great facilities. Beautiful parc. Great water play area. Lots to do in the surrounding region. Friendly staff, tasty food. Shop was a bit spartan in terms of range on offre, but supermarkets closeby. Chalet was older and non air conditioned but we came at a relatively cool time so this wasn't a problem. We only wished we had stayed for 2 weeks instead of 1! Lovely park very clean and friendly staff. Pool slides are fairly small so did not keep teenagers entertained for long - but minor complaint all in all. The staff were very friendly and helpful. The park facilities were very good and clean. Lovely place to spend a family holiday. Brilliant!! kids loved it one at 2 and other at 5!!! Nice relaxing holiday very enjoyable, everything well organised including the fly-drive car hire option! . motoring was a pleasure and no trouble at all. Would certainly recommend to other families especially the motoring and distance from the airport. Was very impressed with eurocamp. Well done! An amazing parc in amazing country side, the pools are fantastic and the parc facilities are outstanding! A lovely camp site in a fabulous location. the swimming pools were excellent and the onsite restaurant was first class. the camp site staff were lovely and obliging. This is an excellent base for touring the dordogne region. The camp site staff were the most helpful we have experienced in the last ten years.10 out of 10. Excellent park, great pool complex and sports/play areas. good range of activities organised by site for all ages. Clean facilities, friendly staff. The weather wasn't very good for our week there so it's really good to have been able to use the covered pool. Fantastic parc for people with children, our almost 3 year old son loved the pools and play areas. The restaurant on site was really good, lovely food and reasonable too but not a great deal of choice for kids. Great holiday! shame about the weather! A great holiday - campsite was a bit hillier than I expected and the weather could have been better - not under anyone's control. What a gem! a beautiful park - and I mean park, created by one man who cares about everything. the pools are superb, the campsites are all private, tree lined and individual, the shower blocks elegant clean and fragrant, the food is stunningly cheap both in the restaurant and the on site shop (below supermarket prices). the owner, benoit, will show you around in his golf buggy until you find the perfect spot to suit you, I cannot recommend it highly enough, we will return next year. Really nice camp and location, aqua parc for kids is great and accommodation was clean. Beds a little uncomfortable but expected. Parc area also great and little shop good. Never done euro camp before so when found out no tv was devastated! in day had stuff to do but of a night a little boring as entertainment only in peak months. Intermarche just down road off camp really cheap. Lovely site.great facilities including the swimming pools which our boys aged 9 and 7 loved.spacious plots and mobile home was clean and well equipped. The only thing that let the site down was the noisy entertainment at night.out of the week we were kept awake 3 nights until after midnight with loud music from the disco.we didn't expect this in early june. Park was outstanding, location was great with some super cycling lanes nearby. Only thing is that the eurocamp blankets are so yuck. We went right at the start of the season but they still smelt and looked really disgusting. Ideally we would bring our own but with 2 small children space is tight. Come on eurocamp they should be cleaned a bit more regularly!! The weather was shocking but the parc was great, and the eurocamp couriers and all the staff were extremely friendly and helpful. the restaurant food quality was excellent. I was very happy with my holiday. The mobile home was o.k. But air conditioning was required. . it is time to consider provision of washer dryers in the mobile homes, rather than carry laundry around the site. La Carabasse - Vias Plage, 34450 Vias-Sur-Mer. La Reserve - Gastes, 40160 Parentis En Born.